Recitation is the act of reciting something from memory. We all remember when were asked to go up to the front of the class and asked to say a poem from memory; that is called recitation. Recitation is basically just the process of repeating a passage, poem or other text, which has been previously memorized. 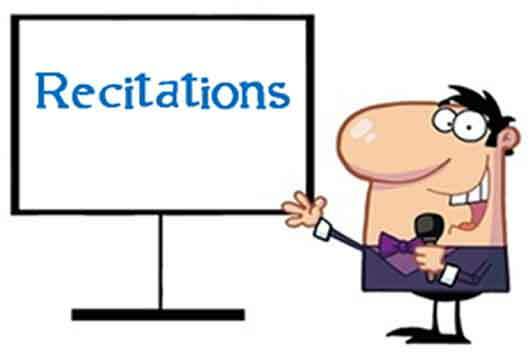 Recitation is usually done in front of an audience. However it is not necessary and can even be done in private or in front of a mirror, still this is mainly done in preparation for a recitation in front of an audience. Recitation these days has become a performing art, where many people go on stage and recite famous poems or monologues from famous works of art.